On June 19th of 1885 the French frigate Isère anchored in the sea of ​​Bedloe’s Island in New York. In its holds was kept an exceptional load as well as precious, 214 crates of robust wood, well constructed and placed, that contained the complete all sections to build the most famous statue in the world. Left the port of Rouen in France May 21, 1885 the White Isère reached the Azores Islands in Portugal on June 2 and then continued the journey across the ocean and enduring storms and strong winds to transport the Statue of Liberty to New York. Gift by France to the United States, in memory of the French-American friendship and the American liberation from slavery, the statue would become the most famous monument internationally recognized as a symbol of freedom and democracy. The author of this extraordinary work of art is the Alsatian sculptor Frederic-Auguste Bartholdi (1834-1904) that came to define the statue after a long period of study and inspiration before then. The most staunch supporter of this hexose project was Edouard Rene Lefebvre de Laboulaye (1811-1883) professor of history and constitutional law at the college of France in Paris, who conceived the idea of ​​a monumental gift to commemorate the centenary of independence of the United States. 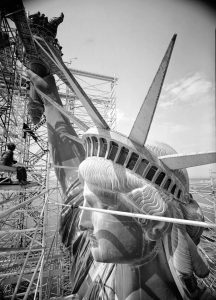 But beyond the well-known story that led to the long gestation of the statue and the construction of the entire project is quite fascinating to discover the technical details and was able to come up with the genius of Bartholdi. The very first series of sketches in clay and plaster of 1867, even before there was talk of the Statue of Liberty and America, represented only the idea of a colossal statue that was supposed to resemble a lighthouse that would guide and direct in the navigated port of Suez on the tradition of the Colossus of Rhodes. 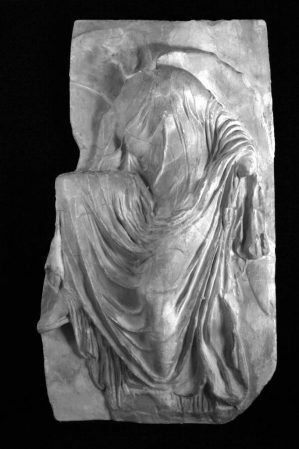 Bartholdi had always been inspired by the majesty of the Egyptian monuments and early sketches representing the “Egypt Enlightening Asia”. 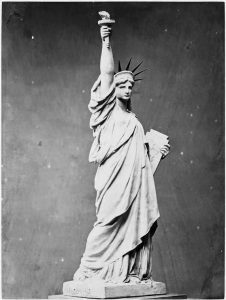 Starting in 1870, Bartholdi agreed to work on the idea of ​​Laboulaye and modeled some sketches of the Goddess of Liberty with the torch in her right hand. 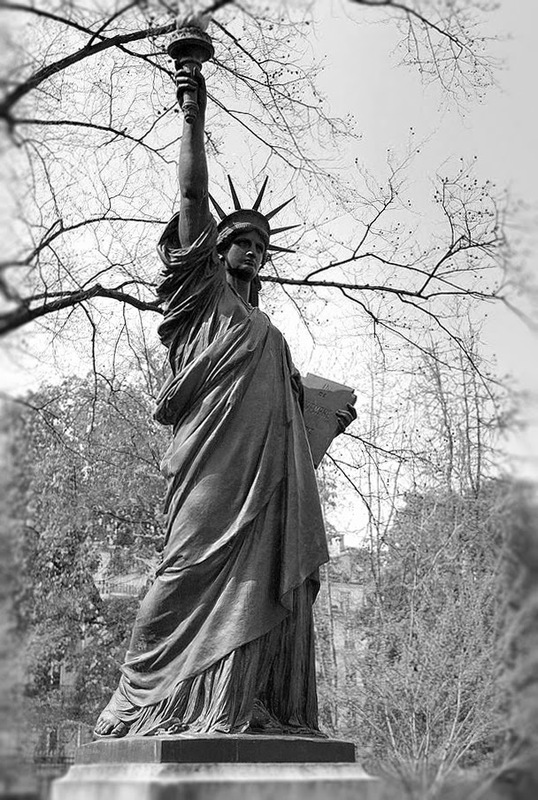 After many drawings and sketches of various sizes the statue was more or less defined and was called Liberty Enlightening the World, the entire collection of sketches is now preserved at the Museum Bartholdi in Colmar. In 1871 the sculptor went to New York looking for the perfect place to erect the monument, was particularly inspired by Bedloe’s Island. A Franco-American union was soon established to initiate the collection of funds for the entire project. Bartholdi knew immediately that his statue, of enormous size, could not be realized in stone nor it would be possible to cast in bronze. For its realization would make use of both modern technologies as traditional techniques. 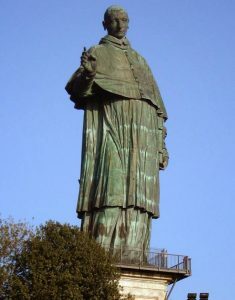 During his second trip to Italy in the spring of 1869 he went to Arona for a close study of the statue of San Carlo Borromeo by Giovan Battista Crespi erected in 1698 and nicknamed il Sancarlone. The statue is 23 meters and 40 cm high, stands on a pedestal of 12 meters. The entire surface is made of copper sheets embossed with the exception of the hands and feet cast in bronze. Inside there is a solid brick walls (on which is embossed the copper) securely anchored to the stone base that houses a spiral staircase that allows access to and attainment of the head where through holes in correspondence of the eye is possible look outside. 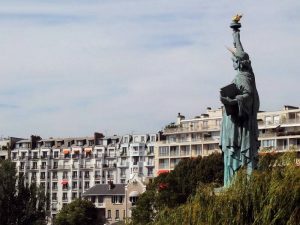 Using the same technique of two hundred years before Bartholdi, also with the valuable suggestion of his engineer and architect Eugène Viollet-le-Duc (1814-1879), decided to build his monument, improving thanks to new technologies. In addition to donations French the statue was made thanks to the great donation of 128,000 pounds (200 were those necessary to run the entire statue) of copper by industrialist Pierre-Eugène Secretan. The metal was very pure and of the highest quality. Viollet-le-Duc advised to fill the statue of sand to prevent collapse in the event of strong winds, but died suddenly, and the project for the internal structure was given to Gustave Eiffel who designed an armor capable of sustaining the entire statue and bear any kind of stress. Edward Moran – the approach of the Statue of Liberty in New York Bay, 1885.
the Sancarlone in Arona, Italy. Following the advice of Viollet-le-Duc was chosen the foundry Honorè Monduit considered the best for this kind of work. Monduit made the left hand, the torch and the flame, then the contract expired, he retired from the business and the project was submitted to Emile Gauget and J.G. 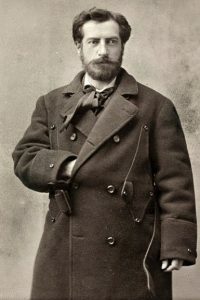 Gauthier who completed the statue. 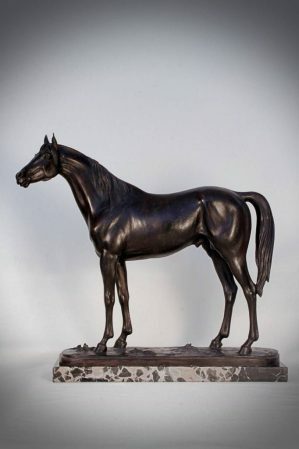 A large number of small bronze statue were produced by the foundry Gauget and Gautier (hence the english word gadget) to be sold for the fundraiser. 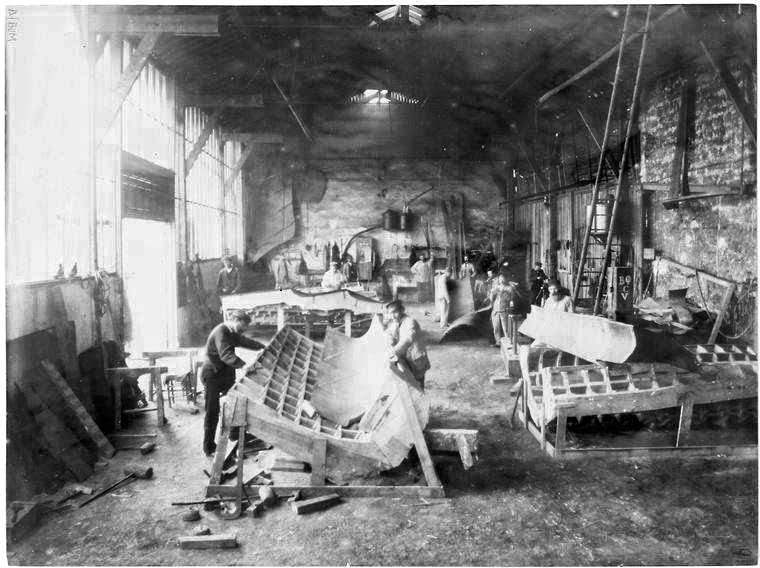 Another foundry, Aviron et Cie at 56 Boulevard Voltaire in Paris, had secured a contract with Bartholdi for the production and sale of the numbered scale models produced in zinc with electroplating in copper. Today the so-called ‘Avoiron models’ have reached a high value to collectors, some were sold by the famous auction house Christie’s. 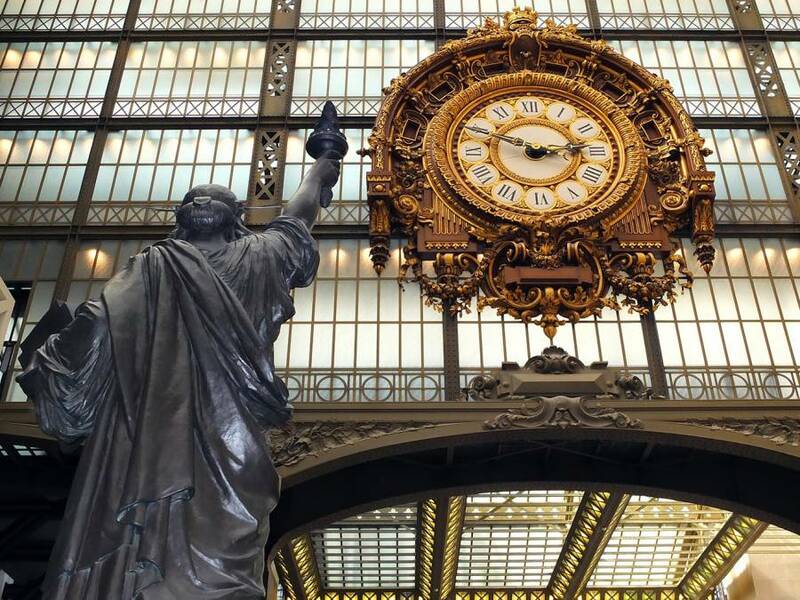 Technically Bartholdi made ​​a series of sketches in plaster, including the famous Modèle du Comité 1.75 meters tall, cast in bronze, which was presented at an official ceremony on November 6, 1875 at the Grand Hotel du Louvre. Subsequently, in the operational phase he executed models to progressive enlargement with the use of pantographs and a large bozzettone a quarter of the full-size final work such as the one today placed in Paris on Pont de Grenelle about 11,5 meters high. Finally, to make the final model, in some large sections, the pantograph was not sufficient. So they proceeded with the direct measurements through a plumb mounted on parallelepipeds scale mounted around the bozzettone and another one (four times large) on the armature wood for full-size plaster model. Above the wooden armor the final modek was modeled directly on the plaster. The individual piece measuring about 3 meters tall, and about 300 main points and over 1000 additional measurements are required. Over 9000 with compass and meter. On the armor of wood Bartholdi and his assistants put plaster and burlap, and proceeded with the ​​direct modeling. 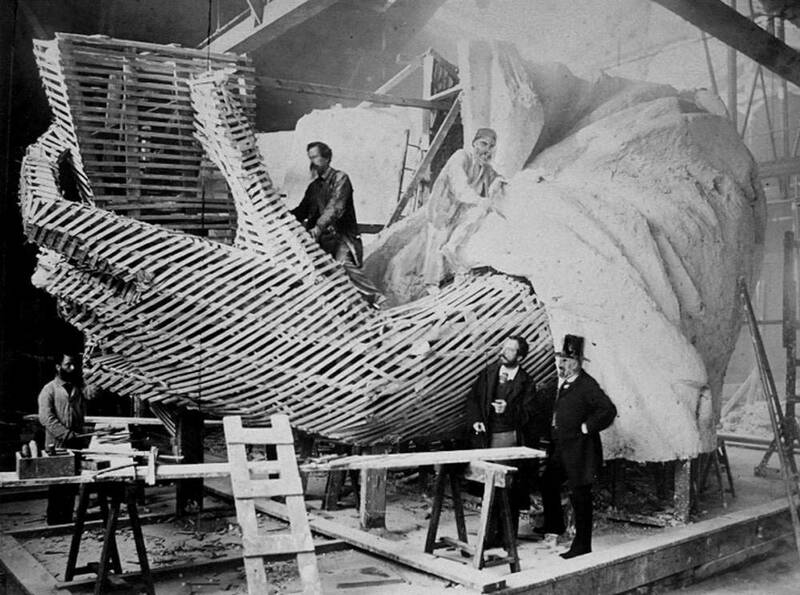 Making of full size plaster model (the second from right is Bartholdi). 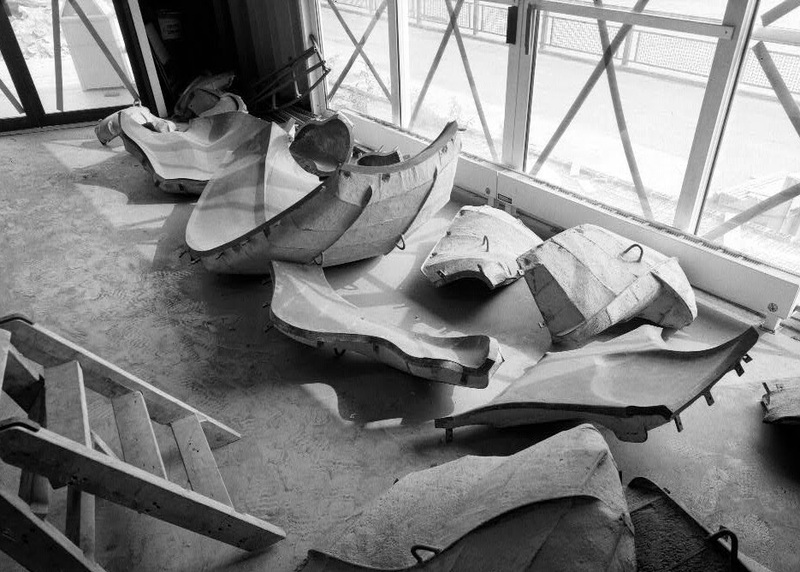 On the full-size plaster model, already divided into large sections, were made wooden molds constituted by a warping of boards longitudinal and transverse, as the hull of a boat, which faithfully followed the shape of the surfaces of the plaster model. The large copper plates 2.5 mm thick were heated and banter with a large series of ‘hammer-beater’ and mallets within individual wood mold, this process of hammering on the reverse side of metal is called repoussé. 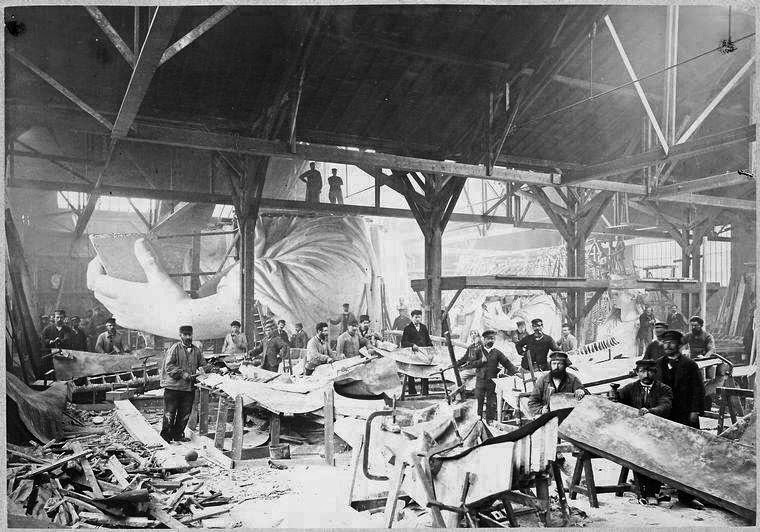 All the work was constantly followed and corrected by the indefatigable Bartholdi always present in the foundry. 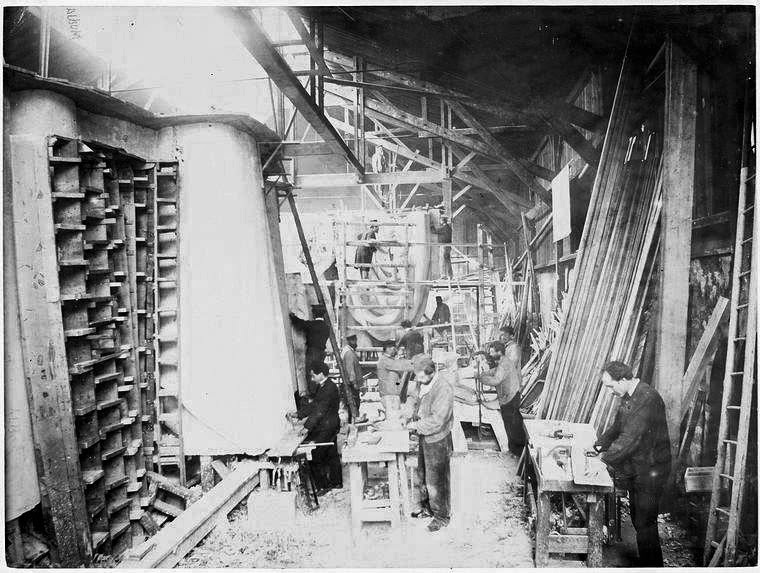 Workers posing for the photograph during the making. On the left the wooden mold and a copper piece modeled. Workers hammering the copper sheet inside the wooden molds. On the left the small sketch, in the middle the quarter model. 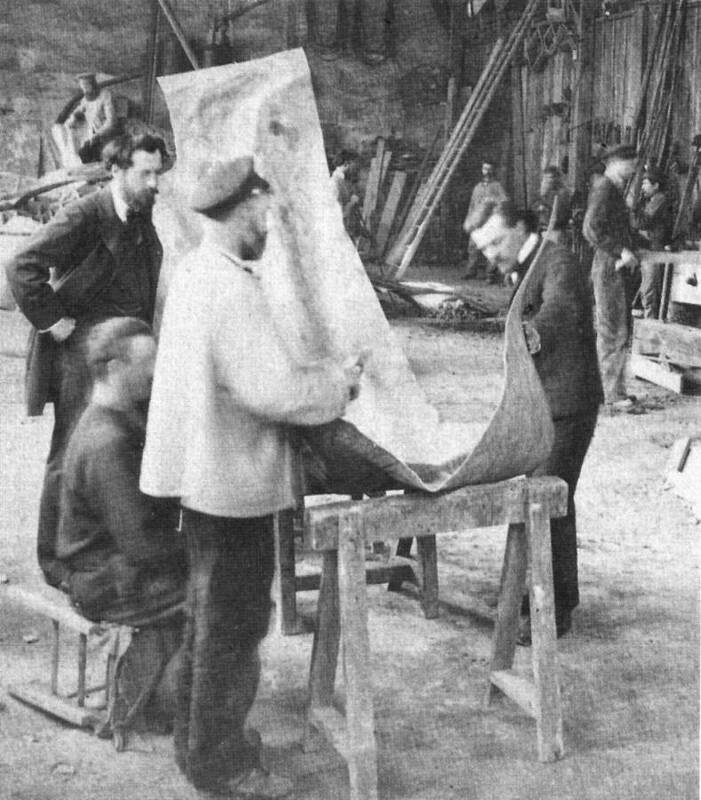 Bartholdi (first from left) at foundry Gauget et Gauthier in Paris during the modeling of the copper sheets. 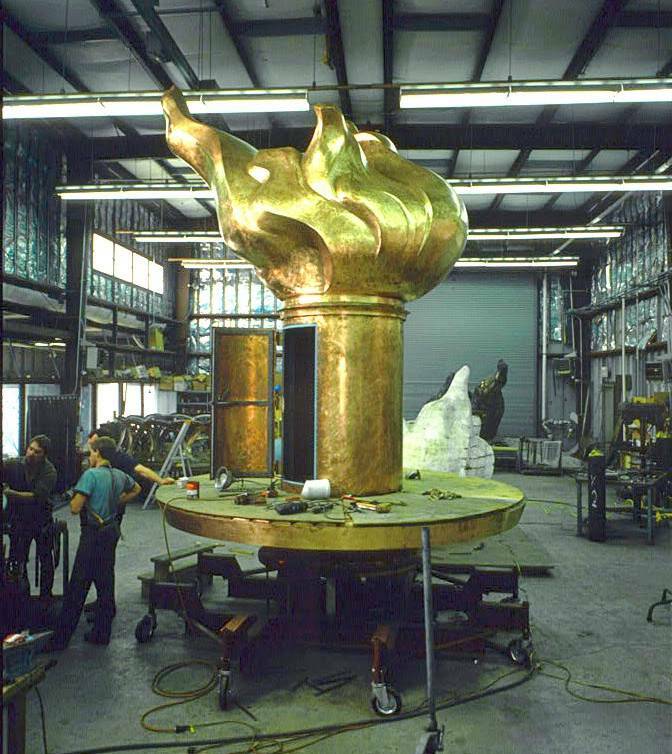 In 1876, the first section of the right hand with the torch and the flame was completed and sent on display in the United States Centennial Exhibition in Philadelphia. Then from 1877 to 1882 was exhibited at the Madison Square Park in New York before being sent back to Paris. In the first half of 1878 began to carry out the models of the head and shoulders. 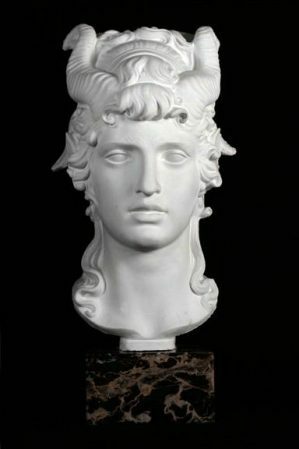 After completion of this portion of the statue was also on display at Les champs de Marsduring the Universal Exhibition in Paris, in July of the same year, where visitors could climb inside the crown. The work went ahead with the construction of the left arm and torso. In 1881, in Paris, the big armor of Gustave Eiffel was completed and ready for assembly of the whole statue. Proceeding with slow and difficult assembly the work was erected. 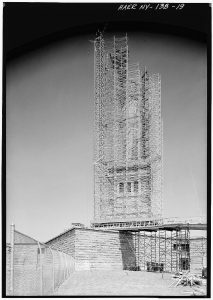 A large and heavy wooden scaffolding allow completion of the statue. The workers of Gauget & Gautier mounted the right arm too close to the head and this caused problems in subsequent years. As the work on the statue proceeded slowly, not without difficulties, also began the construction of the pedestal at Bedloe’s Island. Frederic Bartholdi completed another monumental work, in 1880 was inaugurated the monument of the Lion of Belfort to commemorate the resistance of the France during the Franco-Prussian war. In October of 1883 a colony of Italian workers landed at Bedlow to start the excavation work to accomodate the entire statue. From the center of Paris statue was then removed and placed in 214 cases numbered and loaded on 70 wagons, direct to the port of Rouen to reach New York by the frigate Isere. 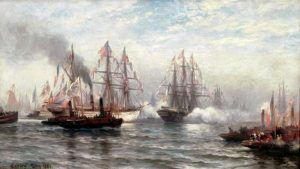 In the sea of New York, the ship was flanked by the Patrol and the Atlantic. The unloading of the crates containing the copper plates, rivets, armor beams and all the necessary material, were carried out with the assistance of support vessels equipped with cranes and lasted a few days. The frigate Isere sailed back to Brest on July 3, 1885. 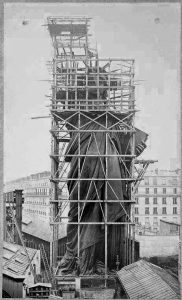 When start the installation Bartholdi also arrived to oversee the operations which immediately proved difficult because the numbers on the boxes were unclear or incorrect and not least the problem that the ‘shell’ of copper did not fit the Eiffel’s armor. 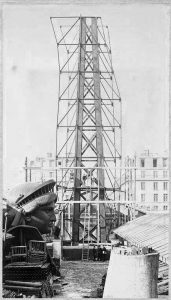 A large number of Italian laborers worked hard to mount the statue with the aid of steam cranes. and the Eiffel’s armor in Paris. The statue just completed in Paris. 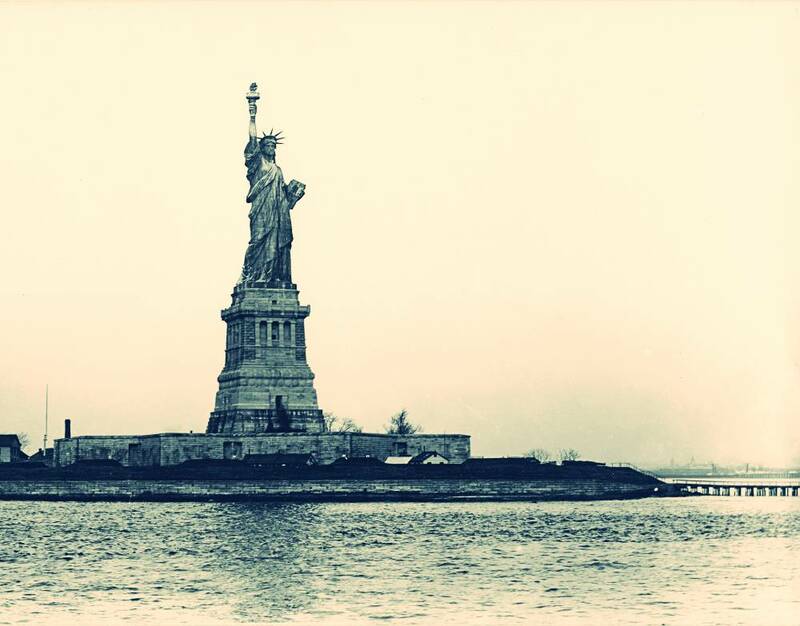 On 28 October 1886, the statue of Liberty Enlightening the World finally completed, was inaugurated in front of the president of the United States Cleveland, the French consul, the author Auguste Bartholdi, many great figures and a big crowd in a solemn ceremony. 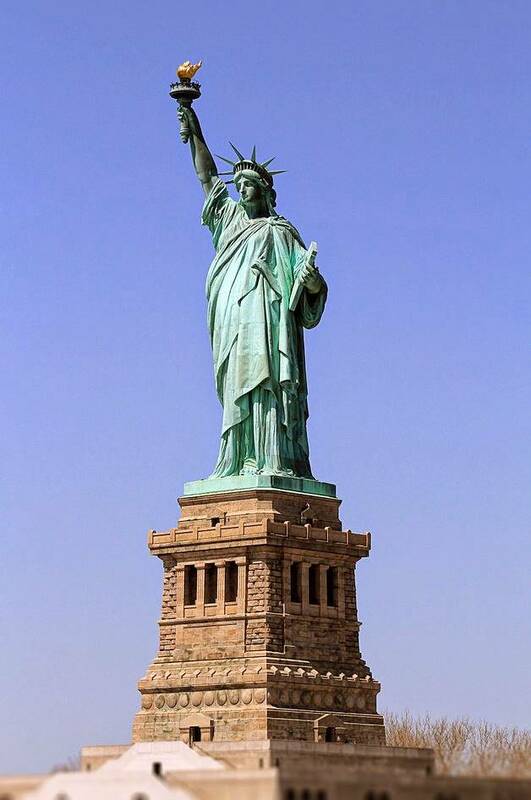 The Statue of Liberty how looks today in Liberty Island, New York. 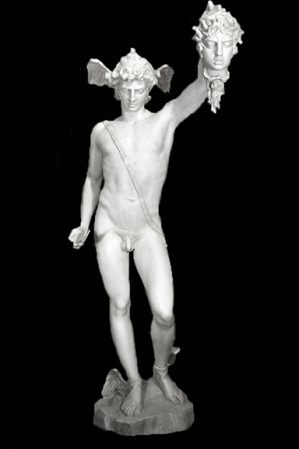 As already mentioned, in 1876 the torch and the flame with a portion of right arm were sent to Philadelphia and then in New York as popular attraction. In 1883 they were shipped again in Paris. During thos trip one of the flares had been altered and relocated in a different position. Maybe Bartholdi had several changes of heart regard the flame, also the model on the Seine is a little bit different. 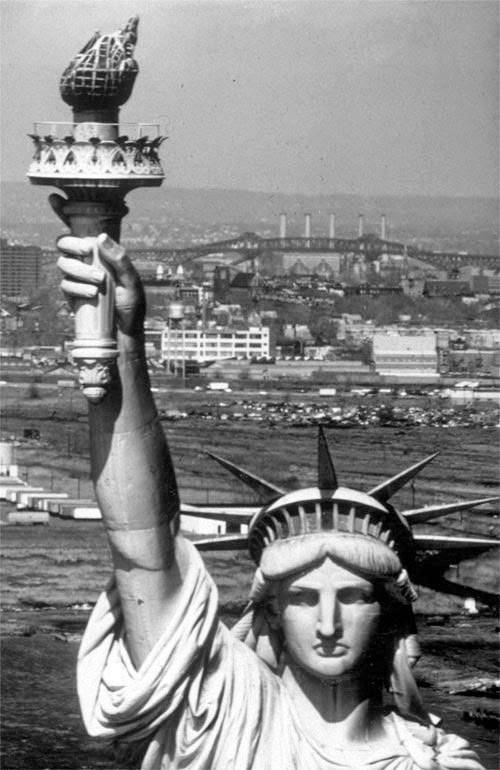 Bartholdi had requested that the golden flame was lit by lights Installed on the platform of the torch. During installation, the experts of the Navy asked the modification of the flame with a rows of illuminated portholes. The flame was again modified in 1892 making a belt of glass instead the portholes and an octagonal piramidal skylight red. 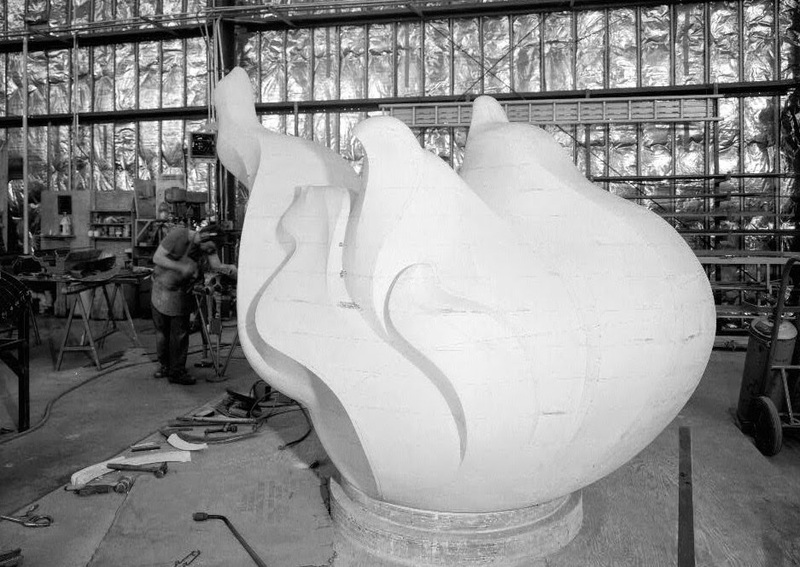 White and yellow glass were installed on the top of the flame, but the shape was compromised. In 1916 a new flame was modeled by Gutzon Borglum, the sculptor of the Mount Rushmore, into a mosaic lantern of 250 panes of amber glass in a copper web. The upper half was modeled cutting the original copper, the lower half was completely removed and replaced with a new. Unfortunately this change defaced the original flame and caused numerous problems of water infiltration. Just before the restoration of 1984 was urgent the removal. Plaster full size model of the flame. Resin mold in piece useful to make the new flame. The new flame before gold leafing. 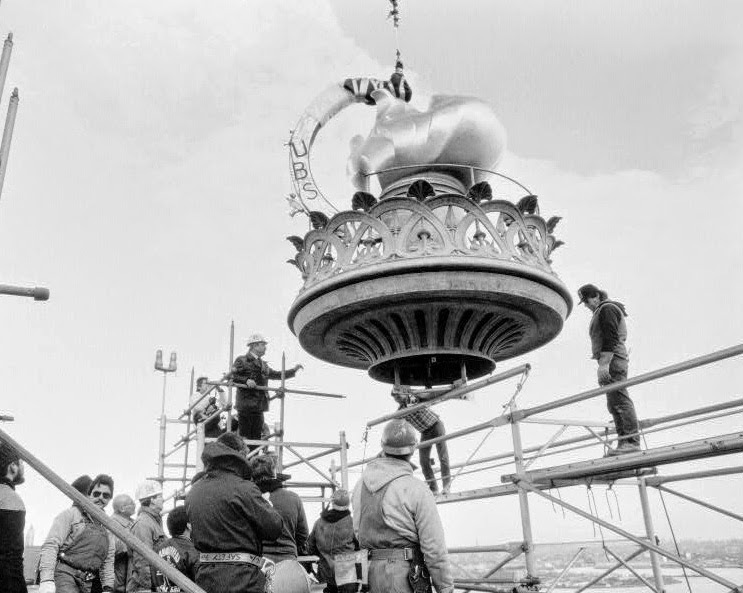 Mounting the new flame on the statue, 1984. Keep a monumental statue made of iron and copper, in a hostile environment such as marine for more subjected to strong winds in the incessant action of the ‘weight’ of thousands of visitors is really a complicated undertaking. It is well understood after a hundred years after its construction when a radical restoration was not only necessary but also urgent. Until then, the statue had been subjected to maintenance and small restorations located. Already in the early eighties was appointed a committee of experts, Americans and French, to establish the directives of the restoration project of the entire statue. Were written a series of reports that put the focus on the general state of conservation of the statue and parts severely affected that they needed for urgent rehabilitation: the torch, the base of the neck, anchoring to the base and layers of paint inside of the armor, which created problems with the surfaces of attachment to the outer coating. In November 1982, the restoration project was ready. The Universal Builders Supply (UBS) Inc. was commissioned to build the huge aluminum scaffolding (not to create oxidation on the surface of the statue) high 122 meters, which was completed in April 1984. All seven layers of paint were removed and the internal structure of the iron was treated with anticorrosive before applying a new coat of paint. Even the green paint that covered the internal surface of the copper was removed and replaced with a new paint. The method of cleaning the paint was different between the two sides in the iron and copper, work was done mainly with sanding with fine sand or aluminum oxide (non-risky materials for oxidation future). However, it was also developed an innovative cleaning system consists of applying liquid nitrogen on the copper surface and by freezing and thereby shrinking off the layers of paint. A solution of sodium bicarbonate was used to clean the whole. The outer surface should be immediately cleaned with deionized water because otherwise the sodium bicarbonate would have affect the original green patina outside. The used protective against oxidation of the metal in a marine environment was a based zinc oxide protective called IT531. of the restoring on 1984. The statue during the restoring. Were replaced elements of the armor already changed during the restoration of 1937-38. New elements are now in low-strength and low-carbon stainless steel 316L. It was necessary to prevent electrolytic reaction and solve all the problems of corrosion at the points of attachment between the iron structure and copper surfaces. 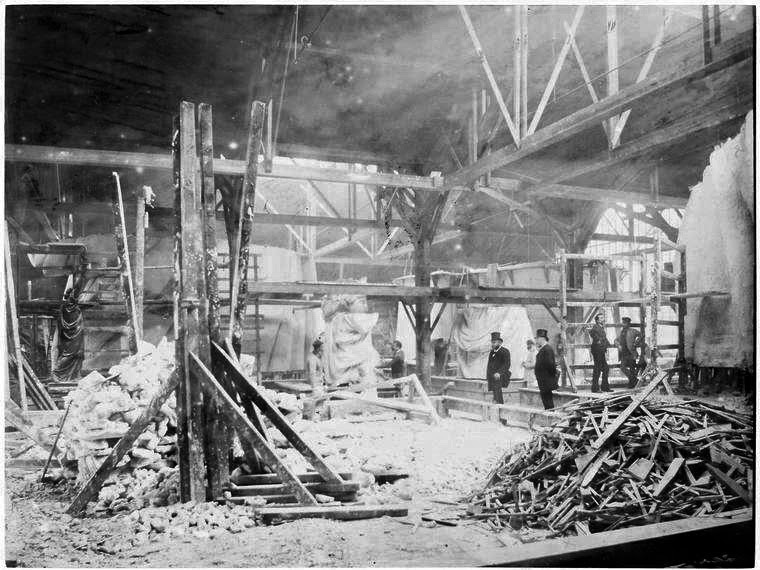 Insulation material used in the beginning was cloth asbestos soaked in shellac, but had caused enormous problems of corrosion and delamination dangerous accelerating the effects of corrosion. Many holes at the rivets let go rainwater feeding the oxidation. In 1911, many treatments were performed with bitumen in these spots and sagging black were visible on the outer surface of the statue, a solution containing copper oxide was used to touch up these spots. The new material used in small areas of contact between the armature and the copper was the Teflon (Polytetrafluoroethylene) tape of DuPont. 1916 Flame resculpted by Gutzon Borglum, installation of bars and closing for public access to the torch balcony for safety reasons. 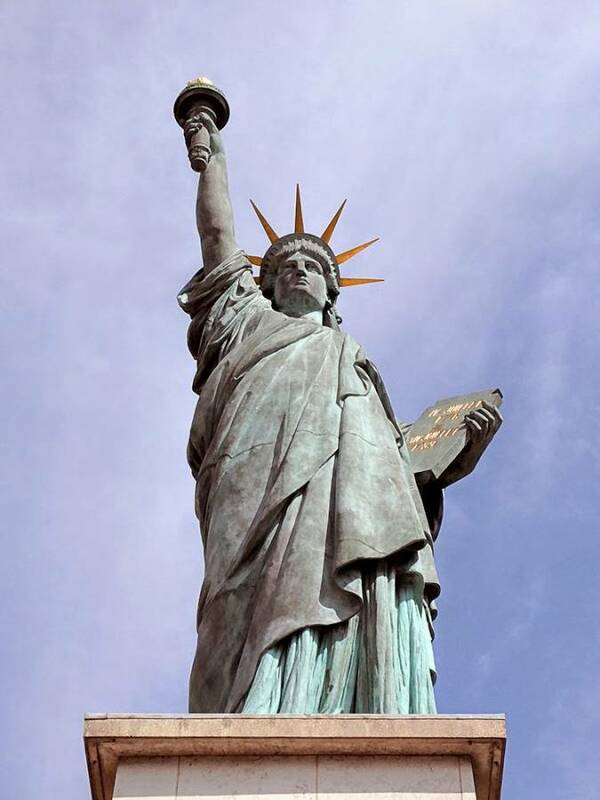 In high winds of 80 km/h the Statue can sway by up to 7,5 centimeters while her torch can move 12,5 centimeters. For those who wisiting Paris and wanted to discover the origins of the statue and the love of the French for their magnanimous project, I recommend to discover the statue hidden in various areas of the city. As a delicious appetizer before the final meeting with the original statue in the bay of New York. First step in Musèe d’Orsay where you can see a small bronze model by Frederic Bartholdi as a welcome in the main gallery. 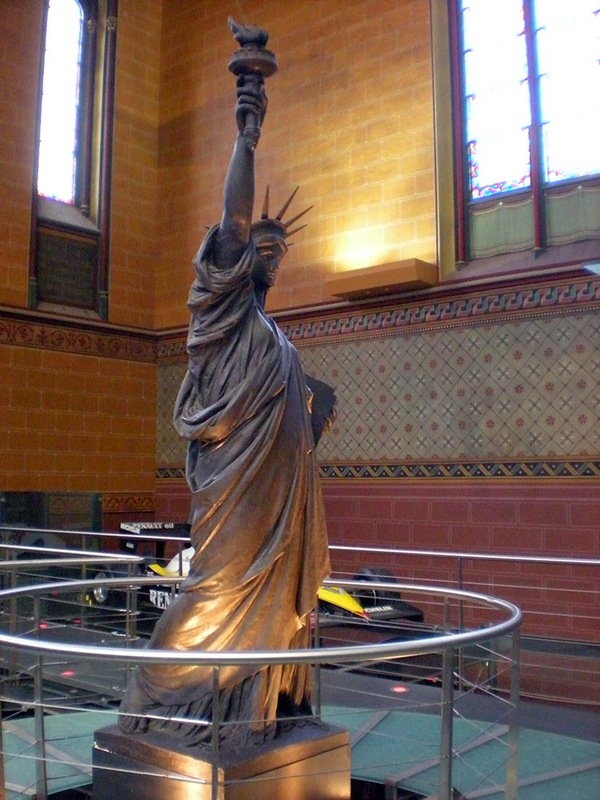 The Statue of liberty small bronze at Musèe d’Orsay (photo by A. Felice 2014). 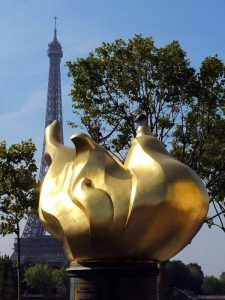 Then, by a ten minutes walking to the Pont de L’alma, you can admire a full size gold bronze copy of the flame domed by the United States in 1986 in occasion of the centenary of the statue. Today the flame has acquired a symbolic value in memory of Princess Diana, who died in de l’alma tunnel a few tens of meters from the flame. With a bit of energy it is worth continuing the walking towards the Eiffel Tower (built by the same author of the armor of the statue of liberty) which is very close and then a quarter of an hour to walk up reaching Pont de Grenelle where, on the Allèe des Cygnes, an island on the Seine, you will find the largest bronze Statue of Liberty in Paris, 11.50 meters high. It was gifted on november 15 1889. The flame at Pont de l’Alma, Paris (photo by A. Felice 2014). The statue at Pont de Grenelle (photo by A. Felice 2014). In the same city there is also a beautiful a small size bronze copy in the Jardin de Luxembourg which was unveiled in 1906. The statue at the Jardin de Luxembourg. An interesting visit to the Musèe des Arts et Métiers give you the opportunity to see the original plaster made by Bartholdi (high 286 cm.) and the bronze copy make from the plaster of the statue. Also a fantastic diorama and an extraordinary scale maquette that reconstructs the stages of construction at the Gauget et Gauthier Atelier. 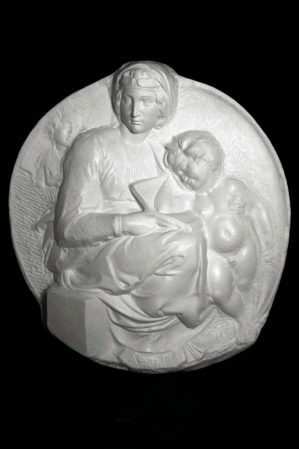 Plaster model at the Musèe des Arts et Metiers (photo by A. Felice 2009). We are passionate about the extraordinary history of this statue. As an icon it is present in everyone’s memory and becomes the symbol of an entire nation. Getting this inspiration we’ve made a unique exclusive replica. 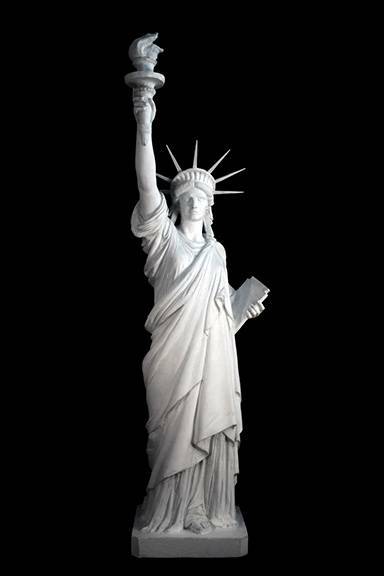 This Statue of Liberty reduction replica is made in our Workshop and it is available to buy.